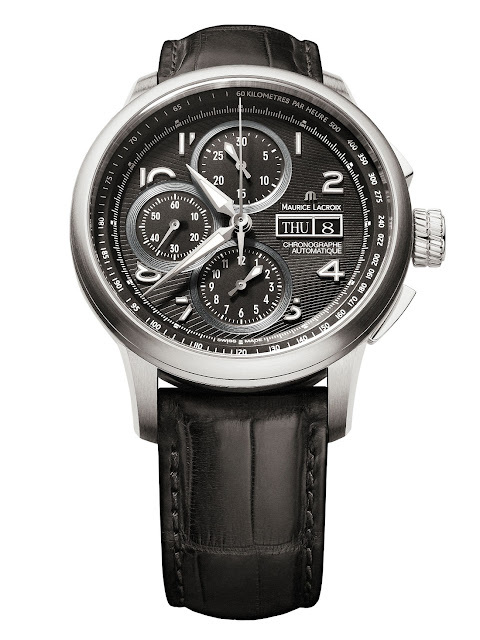 In recent years, Maurice Lacroix has made an international name for itself not least as a chronograph specialist. 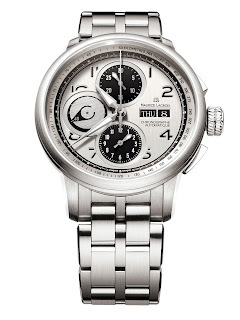 The range of attractive wristwatches featuring a stop mechanism is enhanced this year by the addition of the Masterchrono from the exclusive Masterpiece Collection – a watch model distinguished by its strong and dynamic design as well as its unsurpassed refinement. Although the two dial variants on the Masterchrono fascinate from the very first glance, their innovative, refined and intricate designs don't fully reveal themselves until observed more closely. The first dial has a modern and sporty appearance and an intriguing 3D aspect thanks to a black base and silver-hued, meticulously satinized plate. The generously proportioned and bevelled Arabic numerals and the three counters, accentuated with a circular decoration, are cut to keep the black base visible. The second dial, in black, is more classical, but no less exciting: Its centre is decorated with a sun motif, and the counters are slightly domed. 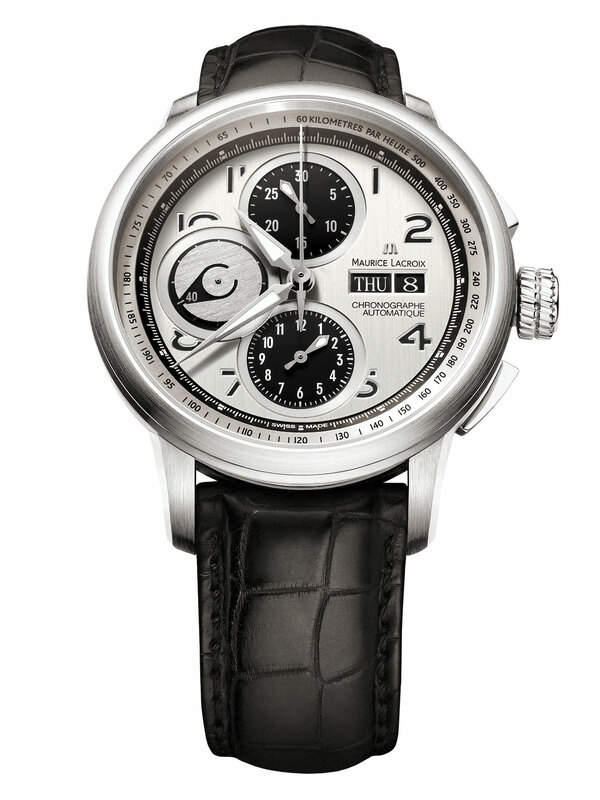 The Arabic numerals are in the "Baignoire" style, forming a small recess and coated with Superluminova. This design guarantees excellent readability in the dark. The stainless steel case, water-resistant to 100 metres thanks to the screw-lock crown, rounds out this luxurious and spirited appearance of the Masterchrono. The generous diameter, measuring 43 millimetres, as well as the exciting contrast between polished and satinized surfaces underline the pure and masculine design. Maurice Lacroix sets great store by detail, as revealed in particular by the crown and the two buttons: The stalwart crown with its powerful and timeless shape can be engaged effortlessly with a mere quarter-turn – exclusive to Maurice Lacroix! – and the satinized and polished buttons reward the connoisseur's attention with their refined, trapezoidal contours. When it comes to a Masterpiece by Maurice Lacroix, it goes without saying that the outward appearance mirrors the outstanding quality of the inner mechanism. The ML 67 calibre of the Master­piece Masterchrono is based on the established Valjoux 7750 automatic movement. What makes it different, however, is its careful decoration, 26 jewels and top-quality oscillation and escapement system. Movement: Hand-decorated mechanical automatic ML 67 movement, 26 jewels, blued steel screws, Incabloc shock protection, polished steel pallet and escapement wheel, Glucydur balance, skeleton rotor, 28,800 a/h. Functions: Indication of hours and minutes with central hands, small seconds at 9 o'clock, central chronograph seconds hand, chronograph with 30-minute counter at 12 o'clock and 12-hour counter at 6 o'clock, weekday and date indication with windows at 3 o'clock, tachymeter scale on the outer dial ring. Case: Stainless steel; screw-lock crown; domed sapphire crystal with anti-reflective coating on inside, screwed caseback with sapphire crystal; water-resistant to 100 m (10 atm), diameter 43 mm. Dial: Solid silver 925; silver-coloured/black or black; Arabic numerals applied and luminous or cut-out and bevelled; luminous hands (hours/minutes/30-minute and 12-hour counter). Watchband: Hand-sewn crocodile leather or stainless steel, with folding clasp.